A study of 700 companies showed that only 25 percent of managers believe their organizations are competent at both strategy and innovation. 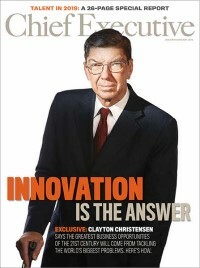 Innovation, defined simply as creating new value for customers, begins with an insight. The insight often centers on a solution to a problem or a way to fulfill an unmet need of a customer. To create new value, you need this insight. Business strategy is defined as the intelligent allocation of limited resources through a unique system of activity to outperform the competition in serving customers. The only way to intelligently allocate resources is to have strong insight into how your product or service provides value to customers in ways that are different than competitive offerings. Doing the same things in the same way as the competition is a common formula for bankruptcy. Just ask Borders or Circuit City. A rich source of strategic innovation is the ability for leaders to move out of their strict mindset of providing either a product or a service, and instead look at the other category as an opportunity to develop their own complementors before outsiders do.